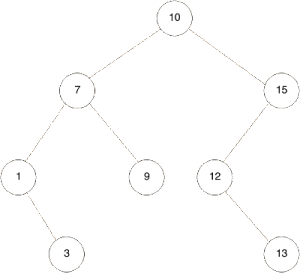 Binary Search Tree (BST) is a data structure organized in such way that each node has comparable key and also satisfies condition that each key in the node is greater than any key in nodes of a left sub-tree and less than any key in the node of a right sub-tree. As you can see this class has its value and two attributes that represent left and right node. This is even simpler class and it has only one node as an attribute – root node of the tree. Now if you look at the printTree() method you will see that it is using same logic with recursive calls of the same method. Second thing that we are going to implement is a method to add new node to the three with proper value. This method will accept value as an argument. Here we need to make sure that by inserting new node we still keep all the properties of BST. Take a look at the below method. Again we are applying recursion in this method, so in general new value is compared with value of current node, in case values are same no new node is added and return from the method is done (you can say that same element is found in the tree). In case new value is less than value of current node and left node of the current node is not null we are calling same method but for left node, but if left node of current node does not exist this means that we found “place” for new value and so we create new node with new value and set it as a left node of the current node. In case new value is greater than value of current node and right node is not null we are calling addNewValue method for right node, but if right node is null this means that we found “place” for new value and all we have to do is create new node and set it as a right node of the current node.